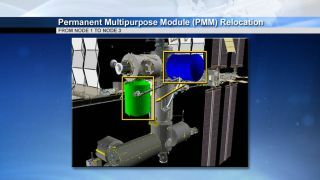 This illustration shows the current location (blue) of the Permanent Multipurpose Module (PMM) on the International Space Station and the location to which it will be repositioned (green) on May 27, 2015. NASA plans to move a piece of the International Space Station Wednesday (May 27) to make it easier for commercial crewed vehicles to dock there, and you can watch the off-Earth action live. Flight controllers at NASA's Johnson Space Center in Houston will robotically move the Permanent Multipurpose Module (PMM) supply depot from the orbiting lab's Unity module over to the Tranquility module. You can watch this process live here at Space.com beginning at 8 a.m. EDT (1200 GMT) Wednesday, courtesy of NASA TV. "This move will clear the Unity port for its conversion into the spare berthing location for U.S. cargo spacecraft," NASA officials said in a statement, adding that the station's Harmony module will serve as the primary docking port for these private vehicles. Two Expedition 43 astronauts aboard the space station will help the ground-based team with the move. Cmdr. Terry Virts and Scott Kelly (one of two crewmembers currently embarked on a one-year mission aboard the station) will watch the module being detached from Unity and reattached to Tranquility. On Thursday (May 28), they will reopen the PMM hatch. Later this year, a pair of SpaceX Dragon cargo spacecraft is expected to deliver two International Docking Adapters that will form a part of the Harmony ports. Each of these adapters will be attached to a pressurized section that will allow arriving spacecraft to equalize their pressure with that of the orbiting lab. Right now, all crews arrive at the station inside Soyuz spacecraft operated by Roscosmos (the Russian federal space agency). The ports on the station are designed to accommodate Soyuz as well as NASA's space shuttle fleet, which was retired in 2011. NASA expects that commercial vehicles from Boeing and SpaceX will carry out most U.S. crewed flights starting in 2017. In September, the agency awarded $2.6 billion to SpaceX to complete work on a crewed version of its Dragon capsule, and $4.2 billion to Boeing to finish developing its CST-100 spacecraft. The PMM was originally used to ferry supplies back and forth during space shuttle missions to assemble the International Space Station. Then called "Leonardo" by the Italian Space Agency (which oversaw the module's construction), it flew to space for the last time on Feb. 24, 2011, and was placed on the Unity module a few days later.